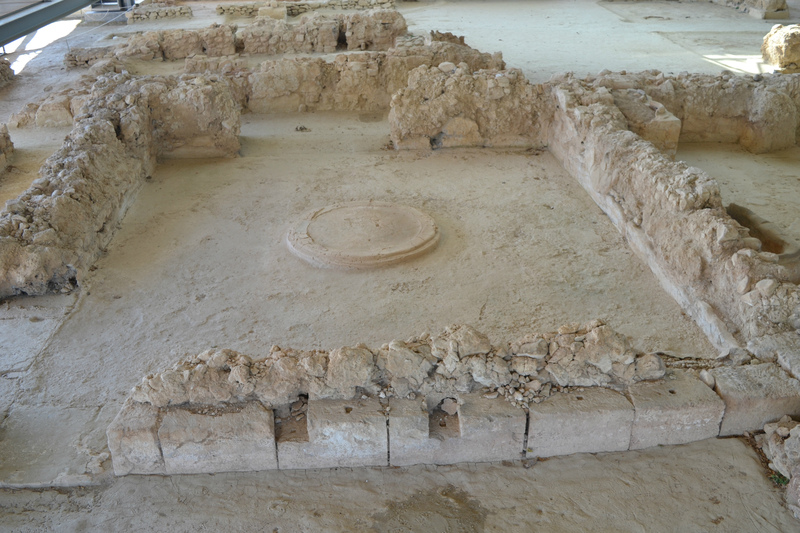 The end of Pylos came in the second generation after Nestor as Pylos was abandoned and remained deserted, Nestor's Palace was burnt and knowledge of its site of was lost. 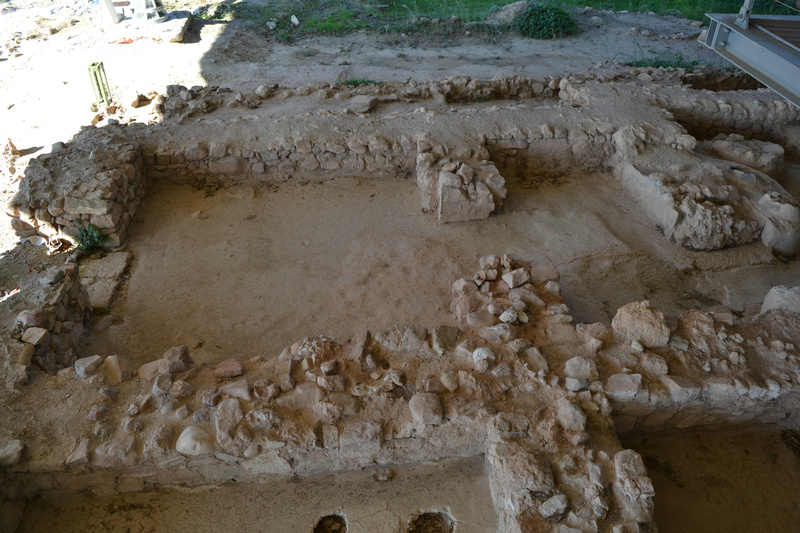 Most ancients and moderns, however, have agreed in placing Nestor's palace somewhere in the vicinity of the Bay of Navarino in western Messenia. 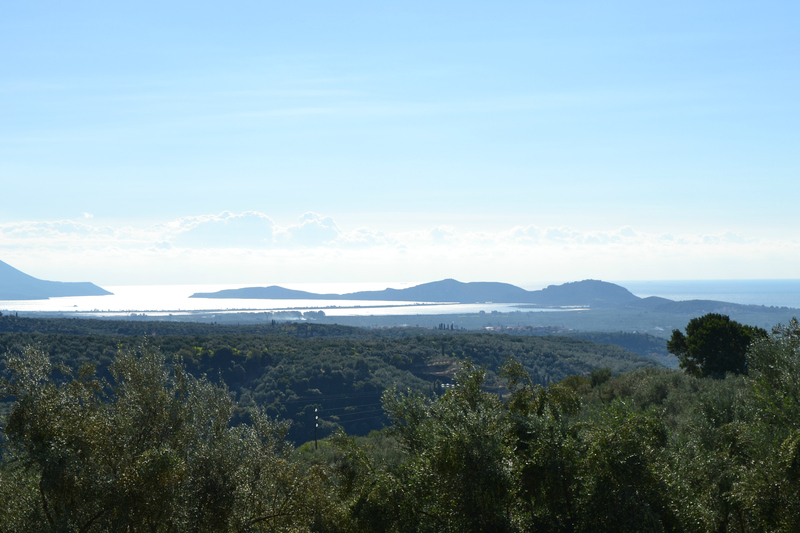 This was also the conviction of Carl Blegen when in 1939 he came to Messenia to search the countryside for any sign of the ancient city of Pylos with Nestor's famous palace. Carl Blegen selected for his first dig a prominent hilltop, a short distance from the sea, which seemed to him suitable to be the site of a royal palace. 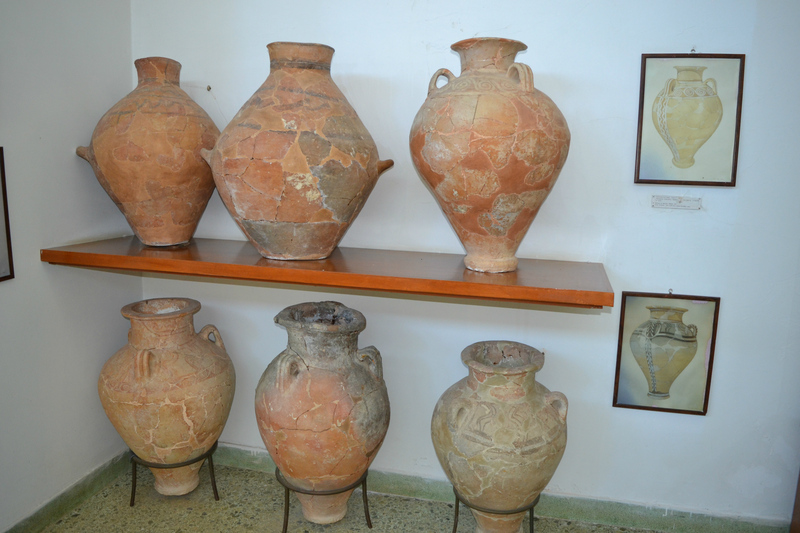 As soon as he began to lift the earth from his first trench, extensive structures began to appear with a great deal of pottery from Mycenaean time. 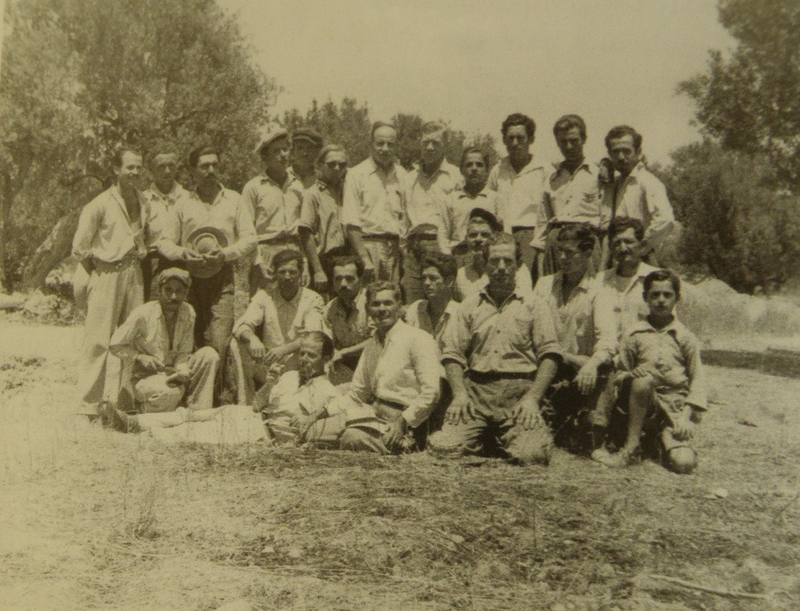 The excavations at Pylos were hardly even begun when war intervened and it was not until 1952 that Blegen was able to return with a team from the University of Cincinnati to organize a thorough campaign of excavation - he was to stay for a dozen years. 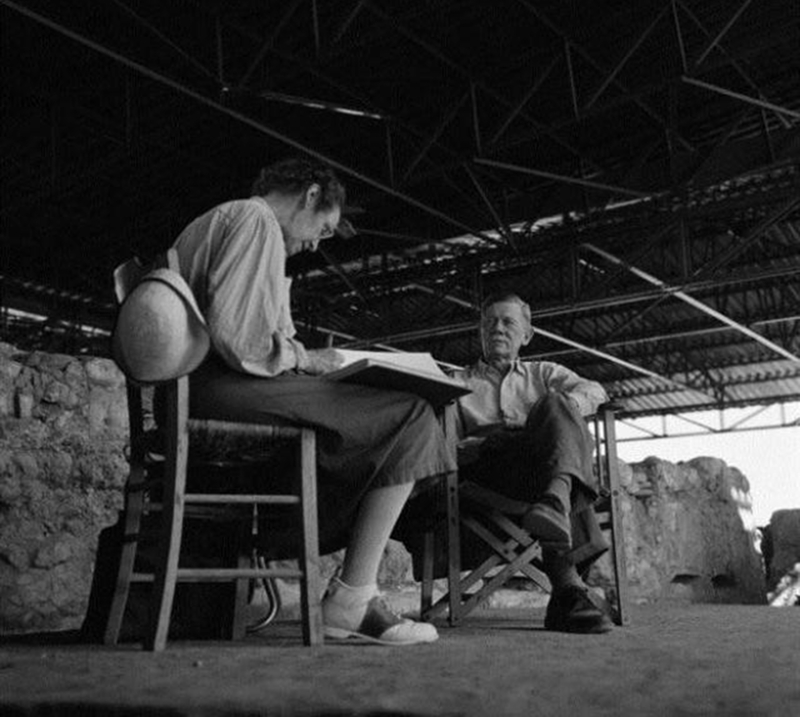 Starting in 1953, Marion Rawson began working at Pylos with Blegen and from 1953 to 1964, she was one of the lead archaeologists in the excavation at the Palace of Nestor. 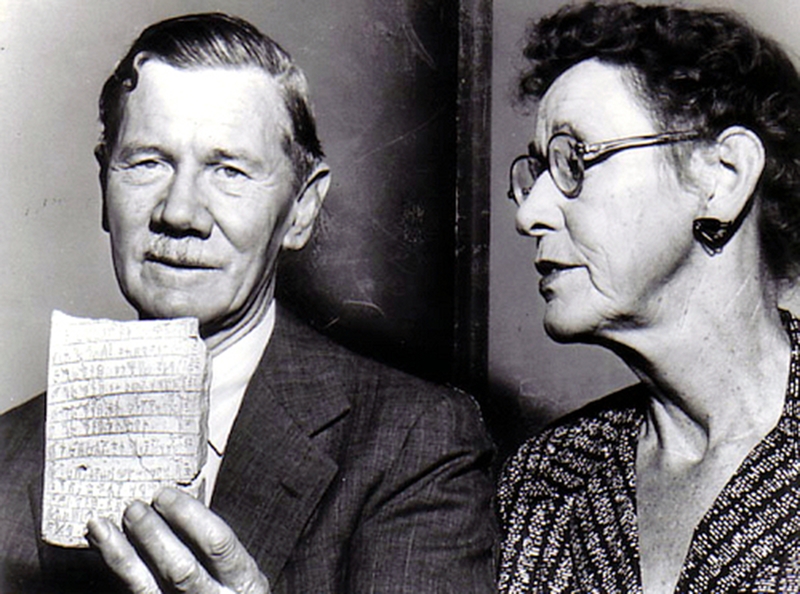 Already in 1939 in the very first trench he dug Blegen had found scores of tablets written in Linear B - and soon there were hundreds of them. The tablets, originally not fired but only dried, would have disintegrated many years before were it not for the fire that destroyed the palace and baked the tablets. A great conflagration raged over the structure and it came suddenly, since neither furniture, pottery, nor the contents of the storage rooms and archives were removed, nor were the animals led away, but all the humans escaped. Such a large number of tablets made the archaeologists question whether the script was Minoan or had its origins on the mainland of Greece. When subsequently more tablets inscribed with these characters were found at other sites on the Greek mainland - at Mycenae and at Thebes - the name "Mycenaean" came regularly to be applied to the script. In 1962, Rawson partnered with Blegen in preparing materials for publication on the work at the Palace. 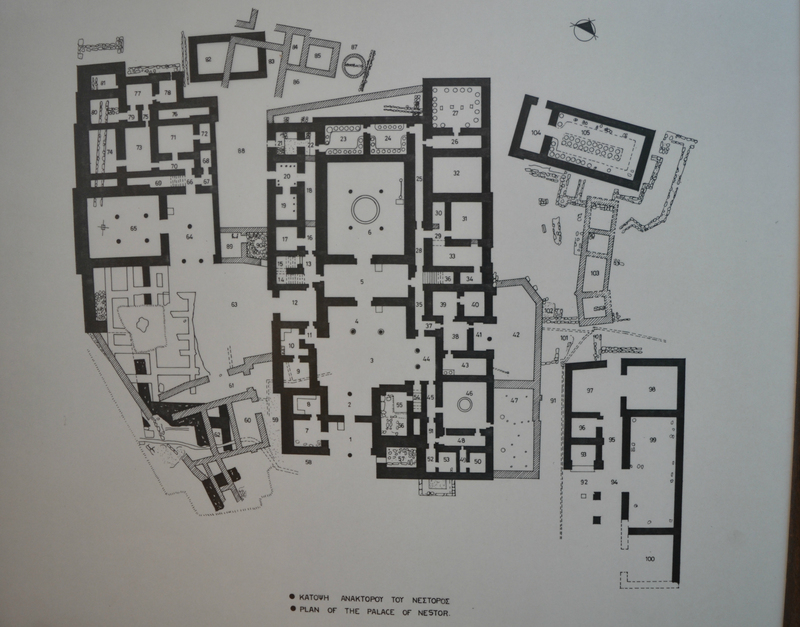 In 1966, Volume I of Rawson's and Blegen's work, The Palace of Nestor at Pylos in Western Messenia was published. 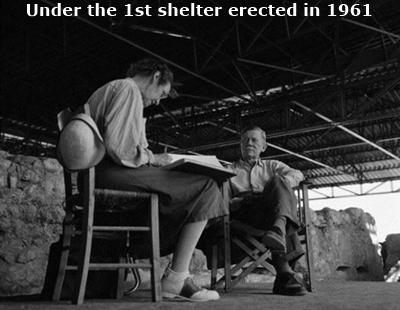 Blegen placed the destruction of Nestor' Palace as not long after the Trojan War, at the close of the Mycenaean age. However, no signs of warfare, siege, occupation by people of another culture or occupation in general were found. Pylos itself had a rather brief existence, according to tradition as no more than four kings were its rulers from its founding to its destruction. It was Neleus, the father of Nestor, who built the city, having come from Iolcus when his brother Peleus expelled him, and settled there with a mixed population of his own followers. Neleus brought great fame to Pylos but later in his reign, when his sons were still only young men, some unexplained disaster overtook the city, remembered in tradition as the destruction of Pylos by Heracles. A large part of the population perished and of Neleus' twelve sons only Nestor survived. 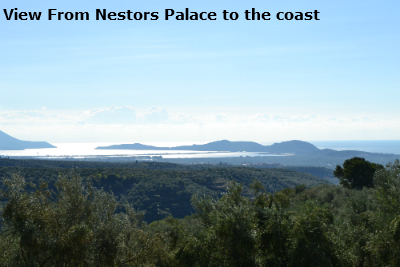 The people of Pylos rebuilt the city on an even grander scale, including a spacious palace for Nestor, who followed Neleus on to the throne. Afterwards the city became involved in bitter warfare with neighboring Elis, and Nestor distinguished himself at the head of the Pylian forces. 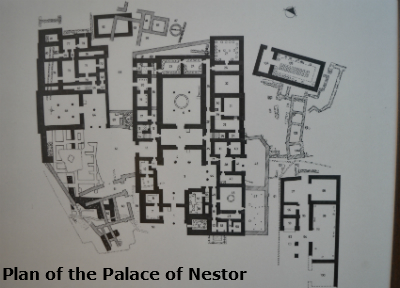 The Palace of Nestor was a two-level building with large courtyards, abundant storage spaces, private apartments, workshops, baths, stairwells and skylights, along with sophisticated drainage. The halls were decorated with remarkable wall paintings, while pictorial representations also decorated the palatial floors. Signs of human habitation on the hill of Ano Englianos are already attested since the Late Neolithic Era (4000 - 3100 BC). In the Middle Helladic period (2050-1680 BC) a settlement with a fortified wall was built. 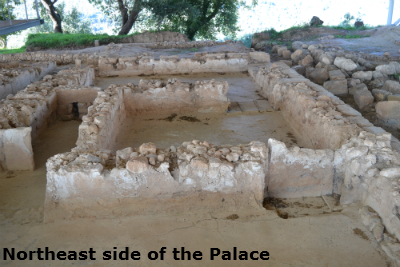 The palace complex consisted of four buildings. The acropolis of Ano Englianos was not fortified contrary to other known Mycenaean citadels in mainland Greece which were surrounded by mighty cyclopean walls. The palace complex was destroyed in the early 12th century BC by fire, in a period of time that was characterized by a general agitation of the populace and while several uprisings took place in the control centres of the Mycenaean kingdoms. Two royal vaulted tombs were also found in the surrounding area, one of which was restored in 1957 by the Archaeological Service. From 2011 to 2015 the Ephorate of Antiquities of Messenia and the Directorate of Studies and Conduct of Technical Works in Museums and Cultural Buildings of the Hellenic Ministry of Culture and Sports carried out the following projects: 1.The Protection and Enhancement of the Archaeological Site of the Palace of Nestor on the Ano Englianos Hill, Chora, Messenia (budget 450,000 euros) and 2. 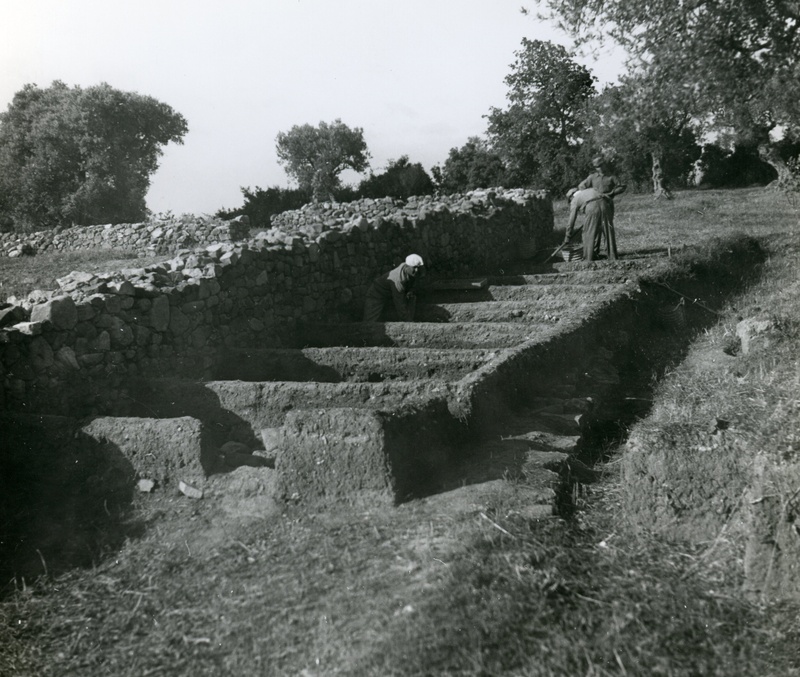 Construction of New Protective Shelter at the Palace of Nestor, Messenia (budget 2,068,400 euros). 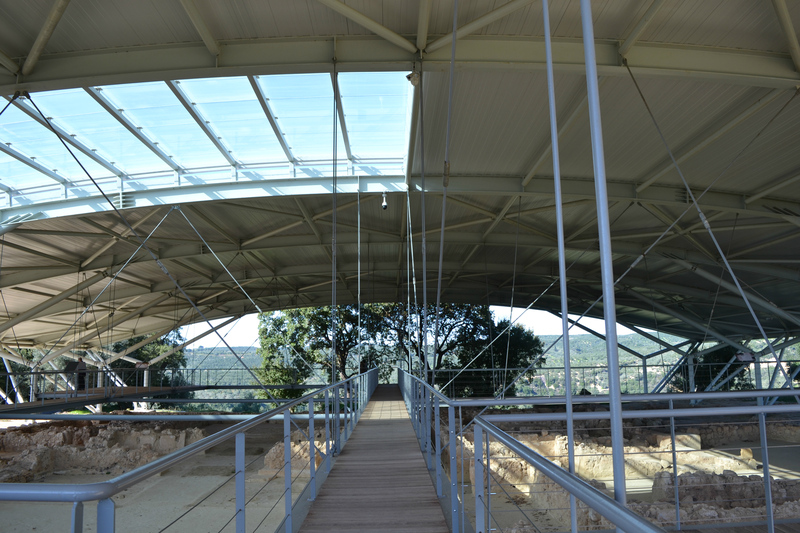 The 2,300 m2 metal shelter, constructed by the Greek Archaeological Service in 1961 with 47 support columns made of Dexion, was in poor condition. It was replaced with the new steel shelter, which protects a 3,185 m2 area of the central palatial monument. 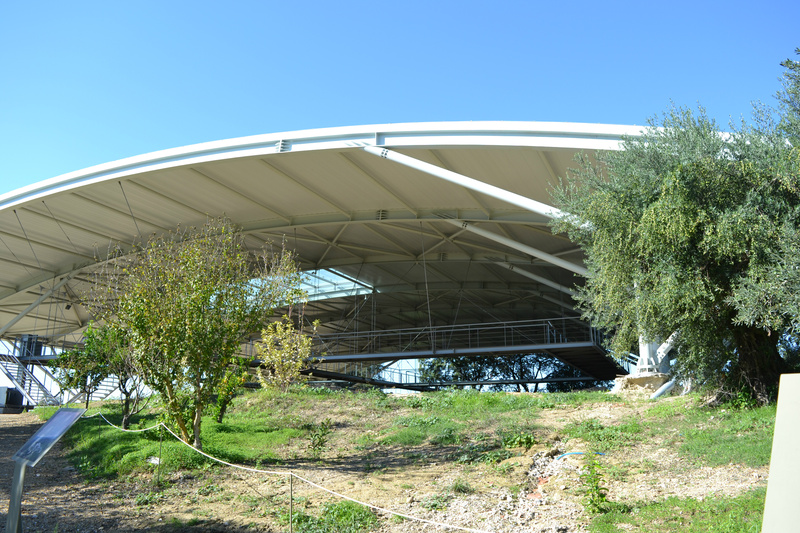 The roof is 51.50 m. wide and has the geometry of an arc with a beam of 84.88 m. It is supported by only 8 columns on each of its 34,88m long sides. 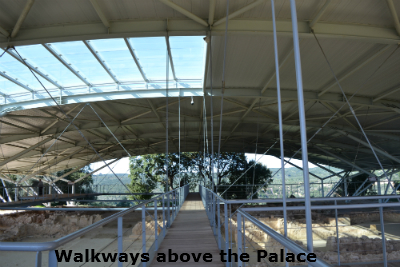 A network of metal walkways suspended from the roof allows visitors to explore the palace from above, while a special elevator provides access for people with disabilities. 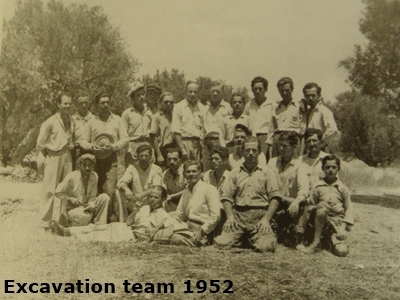 During the replacement of the old shelter, all necessary archaeological research was conducted and documented. The new infrastructure permits visitors to explore the site and provides them with information, refreshments and sanitation facilities, while paying special attention to people with disabilities. King Nestor son of Nelios, was one of the Achaean chieftains who, according to the Iliad, went with his fleet of 90 black ships to Troy (only Agamemnon sent more ships) to get Menelaus' wife Helen back from Paris, and was one of the few to return safely. He is described by Homer as wise, eloquent, and a peacemaker, and is said to have lived to over a hundred. 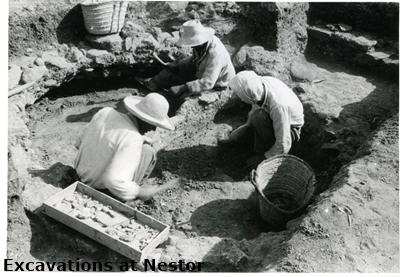 In 1939 Carl Blengen found the remains of a Mycenaean Palace 10 miles north of modern Pylos at Epano Englianos, and this is now believed to be Nestor. 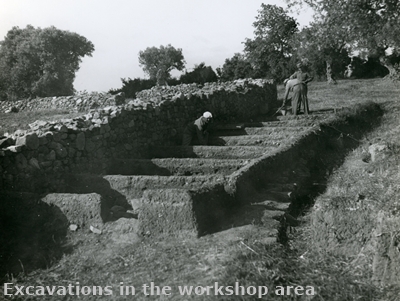 Excavations were stopped during the war and restarted in 1952 continuing until 1966. 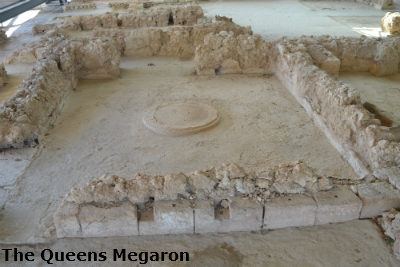 The Queen's Megaron was an independent suite of rooms next to the guards' headquarters ; it has an open-air, enclosed court , interior corridors, and ancillary spaces. The central hall was an elegant rectangular room with three entrances, its walls and ceiling richly decorated. In the center of the room is a circular hearth, smaller than that in the Throne Room, but similarly painted with flames, zigzags, and spirals. The walls of the room were decorated with frescoes that depict both wild and mythical animals, such as lions and griffins. The frescoes and the hearth attest to the official nature of the space. Because of this, the possibility cannot be excluded that this room was used by captain of the guard and his officers and that the queen's apartments were instead on the upper floor. 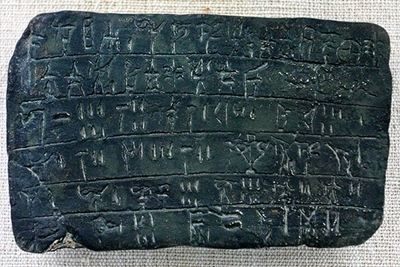 Inscribed clay seals and tablets found refer to repairs of leather and metal objects, to provisioning of bronze and hides, and to accessories for chariots. 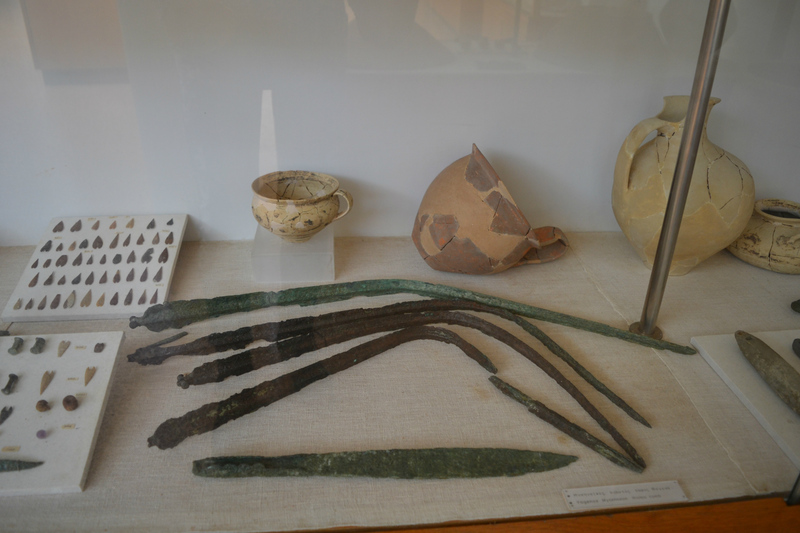 The many bronze arrowheads found in two of the rooms suggest that the building was also used as an armoury. 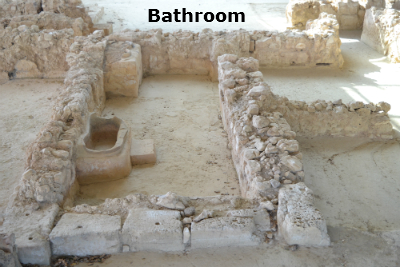 Of particular interest is the small room, the only example of a bathroom yet found in a Mycenaean palace on the Greek mainland with its equipment still fairly well preserved. 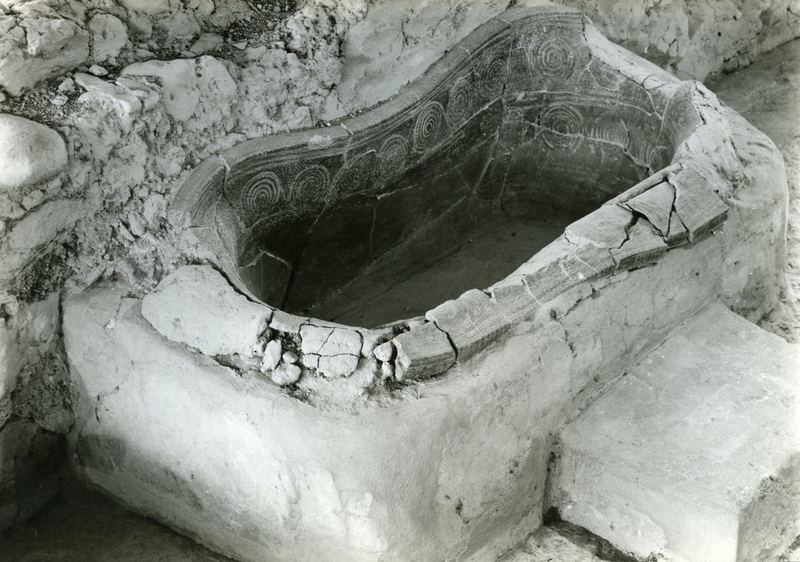 It was identified by excavator of the Palace, as the royal bath. 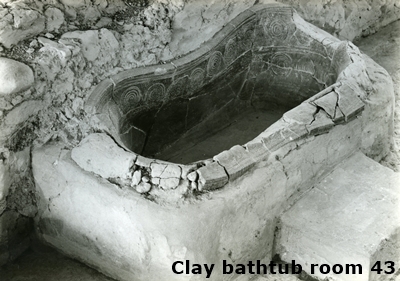 A large clay tub with spiral decoration, is built into a bench coated with plaster and a clay stepstool made it easier for the bather to get in and out of the tub. 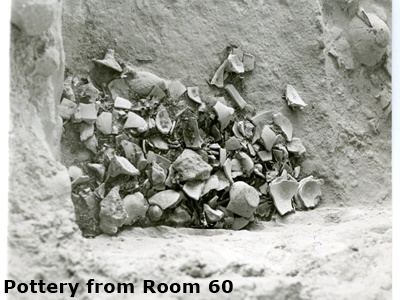 Two large jars built into a high clay bench in the south corner of the room were probably useful for the storage of water and aromatic oil. On the northeast side of the Main Building is the best preserved original outer face of the Palace; in places the exterior wall stands nearly to a height of one meter. In the middle of the wall is a gateway with a wooden column in its facade. The gateway opens into an enclosed court; a terracotta pipe through its wall supplied the palace with running water. 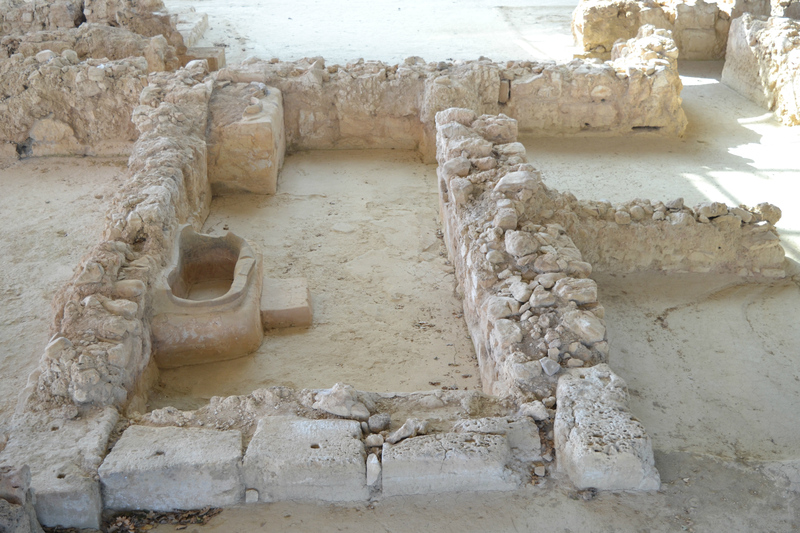 In older building phases, a road ran from the gateway through the northeast gateway of the acropolis to a cemetery that included Tholos Tomb IV. 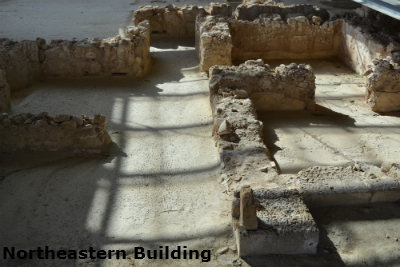 North of the court, outside the limits of the palace, was an independent two-roomed building with rows of large jars (pithoi) inside. Clay sealings allow the structure to be identified as a Wine Magazine. Recent excavations have uncovered evidence for older phases of occupation under it. A large part of the Throne Room was bordered by rooms in which regular and aromatic olive oil was stored. 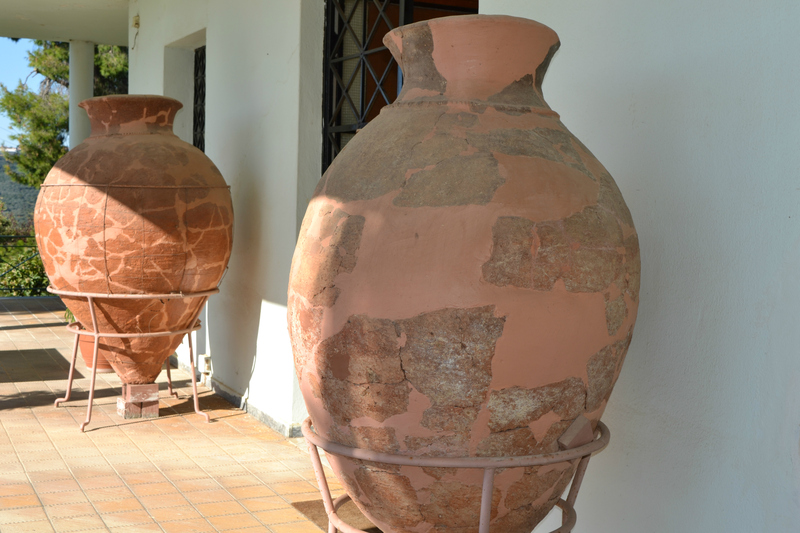 The oil was kept in large jars (pithoi), built into clay benches coated with stucco. The production of aromatic oil and its exchange was an important economic activity of the Palace and one of its most well organized industries. 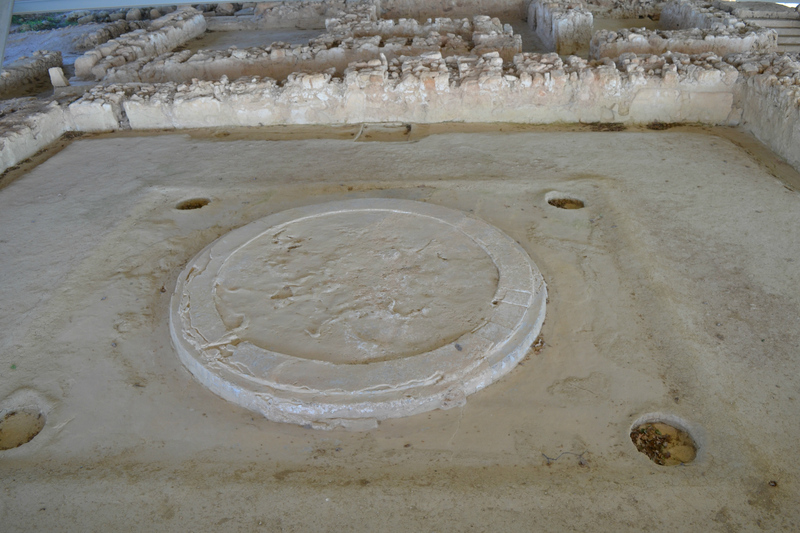 In the tablets from the Palace there is information about various types of aromatic oil, the method of their manufacture, and the various uses to which they were put. False-spouted (stirrup) jars were used for its transport, vessels that were employed in extensive exchange networks within the eastern Mediterranean c. 1450-1080 B.C. . Oils were used in funerary and religious rituals, for medicinal purposes, and in daily life (e.g., as lotion applied after a bath or used in the processing of cloth). 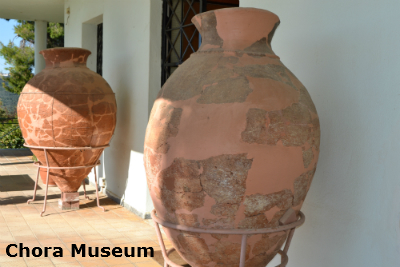 The jars are on display in the Chora Museum which is approximately 4km from Nestor's Palace. 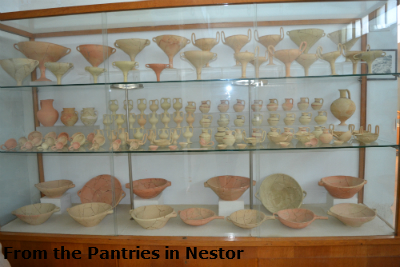 The Pantries provided storage space for pottery belonging to the Palace. In rooms 18-22 of the Main Building were large quantities of tableware, especially cups and kylikes. In pantry 19 alone, there were 2,853 examples of the kylix, the drinking vessel par excellence of the Mycenaean period. 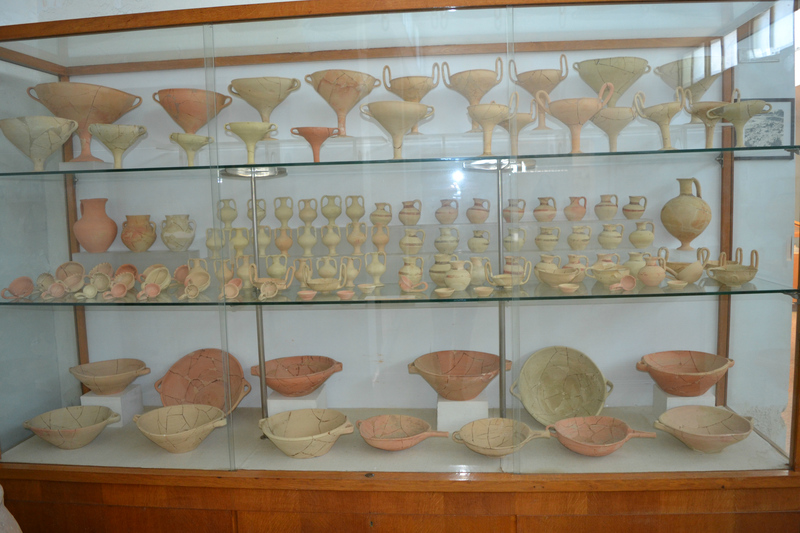 These vessels were stored on shelves, until required to serve the needs of the Palace or to be traded. Nearly all were broken when the shelves collapsed in the fire ca. 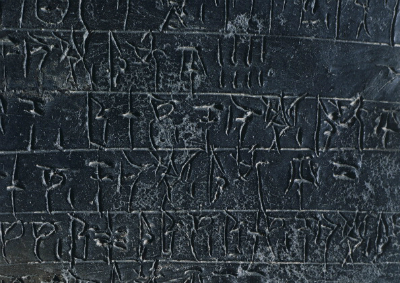 1200 B.C. Their quantities testify to the frequency of banquets that were attended by large numbers of people. Feasts were perhaps held in the spacious, open-air court 88, which communicated with rooms 20 and 21. The organization of lavish feasts in the context of religious, secular, and political events was one way to demonstrate and, at the same time, reinforce the power of the wanax. 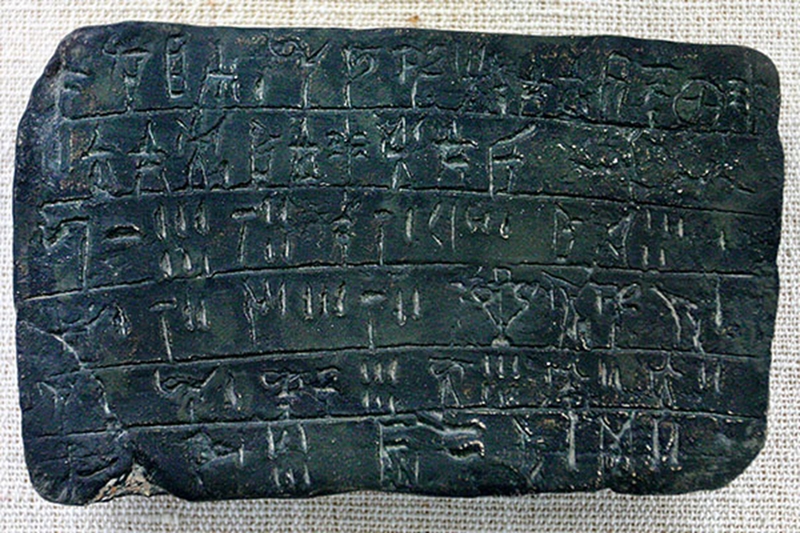 Wanax is an official title in LINEAR B (spelled wa- na-ka), referring to the ruler of a Mycenaean palace state. The word appears in HOMER as anax, with usage mainly restricted to gods and "supreme" rulers such as AGAMEMNON. 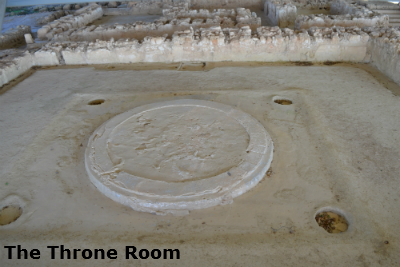 The great Throne Room was the seat of royal authority. 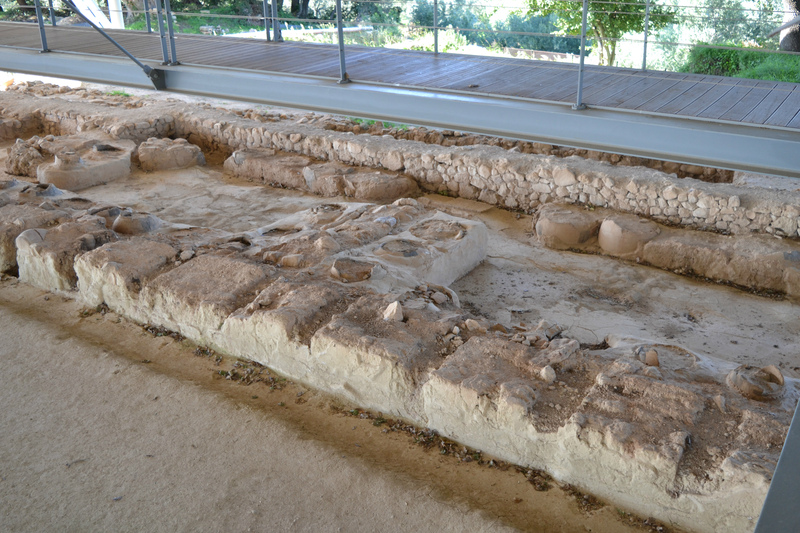 It was the place where the wanax (king) received important foreign visitors and representatives of other Mycenaean kingdoms. In the centre of the room is a large hearth. It was framed by four fluted, wooden columns, which supported a surrounding balcony) and a high clerestory or lantern. It was coated with stucco, then painted with a flame pattern, running spirals, notches and possibly rosettes. To the right of the entrance, in the middle of the northern wall, stood the throne, probably wooden, decorated with ivory and other precious materials. The floor of the room, its walls, and its ceiling were richly adorned with linear and pictorial motives. On the walls behind the throne were depictions of lions and griffins; to the right was a scene of dining. Also depicted was a musician holding a five-stringed lyre. 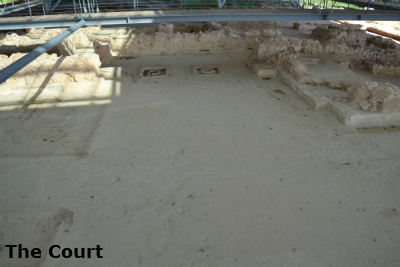 A spacious interior Court, also paved with plaster, led to the Megaron with its Throne Room and to subsidiary wings of the Main Building. On the right side of the Court was a porch with two fluted wooden columns that supported a balcony. From the balcony, officials of the Palace could comfortably observe rituals that often took place in the Court. To the left of the Court was an apartment with two rooms: a canteen and a waiting room. On the floor of the canteen many stemmed drinking cups are still visible, misshapen and preserved by the fire that destroyed the Palace at the end of the 13th century B.C. In the waiting room is a bench with painted decoration, on which visitors probably sat before being presented to the ruler. 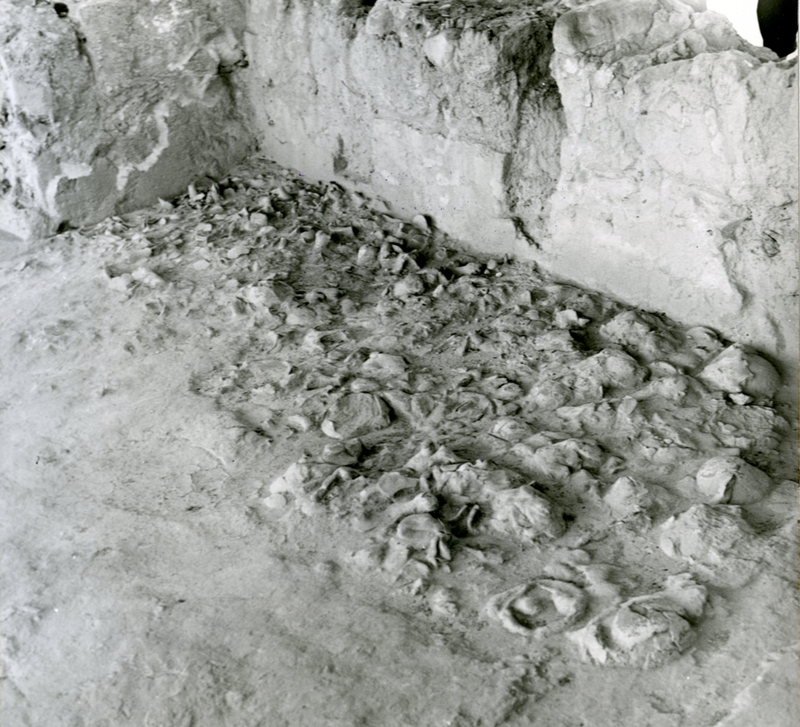 In an independent two-room unit left of the principal entrance to the B' Main Building, more than 800 clay tablets written in the Linear B script were found. They had been baked (and thus accidentally preserved) in the fire that destroyed the Palace. In one room of the Archives there was a plastered bench, on which scribes probably placed tablets after information was recorded and before they were arranged by category on wooden shelves. 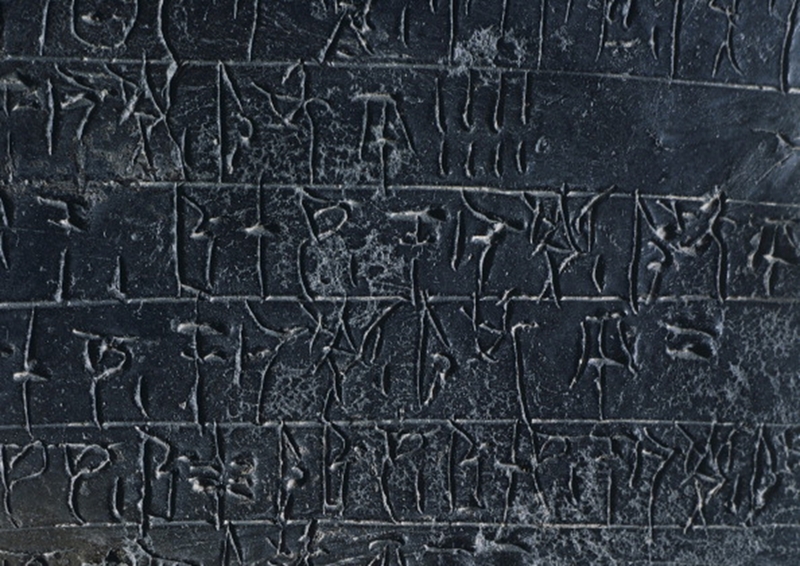 Linear B was used to represent an early form of the Greek language, and it is the oldest script on European soil that can be read and understood. 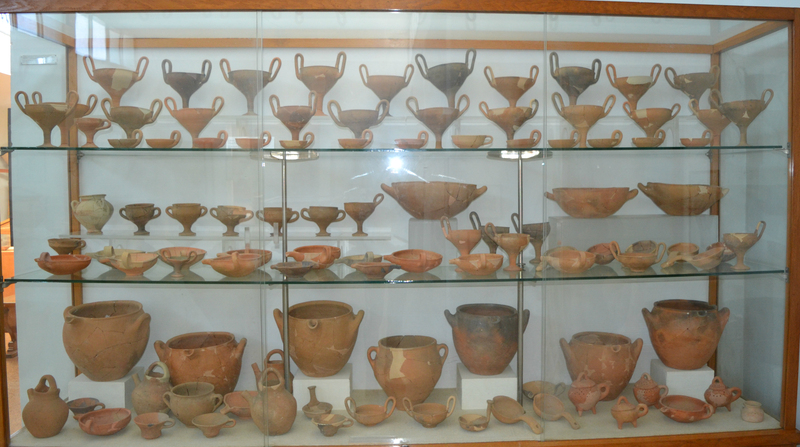 The Archaeological Museum of Chora whose collections focus on the Mycenaean civilization, particularly from the excavations at the Palace of Nestor and other regions of Messenia. The museum was founded in 1969 by the Greek Archaeological Service under the auspices of the Ephorate of Antiquities of Olympia. 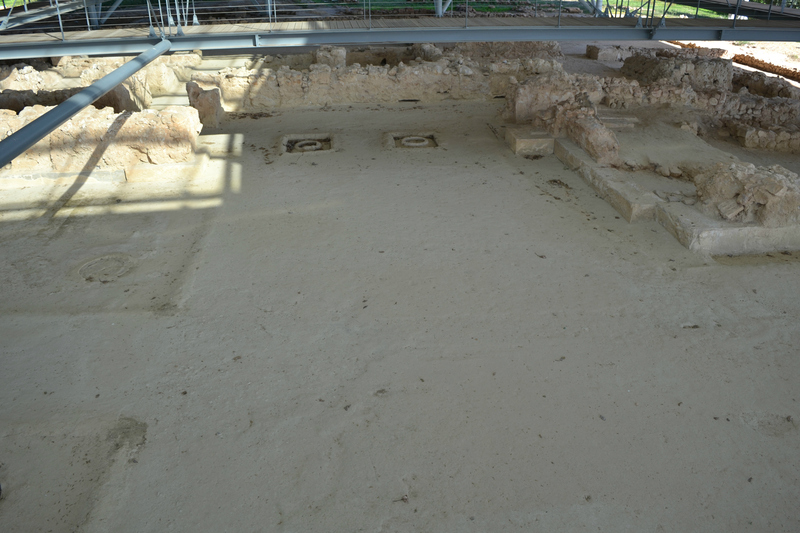 The exhibition space is divided into three consecutive galleries which hold finds from the excavations of the Palace of Nestor, the tholos tombs of the Englianos area, and other nearby archaeological sites. 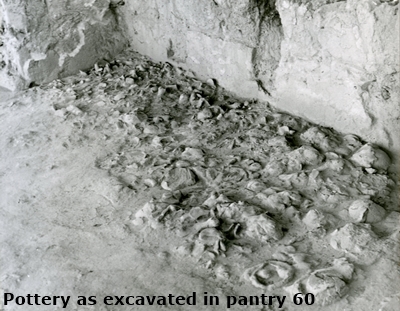 Most of the finds are grouped according to the location where they were found. The Nestor tablets include accounting records that record quantities of finished goods and raw materials, duties, deficits, the allocation of taxes and debts, as well as the distribution of raw materials to craftsmen. They also contain valuable information about the political constitution of the kingdom, its administrative structure, the economy, its social fabric, and religion. The script was used exclusively for administrative purposes in the palaces of Mycenaean Greece (Mycenae, Tiryns, Pylos, Thebes) and Crete. 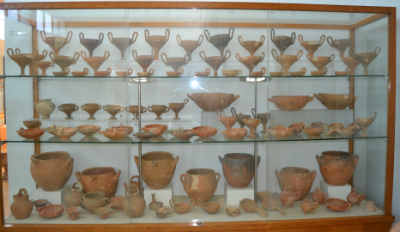 This case contains pottery from the Palace's pantries and from the dumps of the acropolis includes cups, kytathoi, kraters and some beveled jugs. 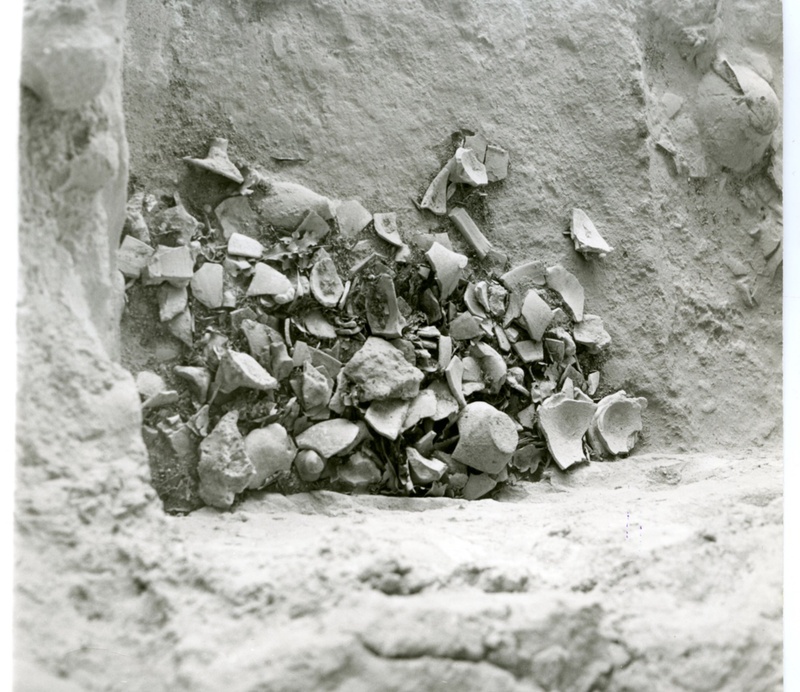 The items include cooking pots, stemmed kylikes, scoops and ladles, probably used for cooking, drinking and feasting. Grave goods from Vayenas Tholos tomb which is actually a grave circle. The items from this tomb belonged mainly to warriors but a few suggest at least one female burial. The items include Late Helladic pottery, prochoi, a three-eared amphora, a pair of copper scales, a personal care set made of copper and ivory, sheaths for daggers which apparently formed part of a Mycenean warrior's armour, and a large number of daggers and swords, some of which are bent. The bent swords allude to the fact that their owners, former warriors, will never again need them.